This year's Bee will be held on Thursday, May 9 from 6 to 9 PM at Neil Armstrong Middle School. Prizes include a $250 Amazon Gift Card for the winner; a $150 Amazon Gift Card for Second Place and a $50 Amazon Gift Card for Third Place. Parents whose students would like to participate should print off the Parent Permission Slip, complete it and return it to their child's Third Grade Teacher by Tuesday, April 30. Students can prepare for the Bee by studying these spelling words that can be found here. The winner of this year's Bee is eligible to compete in the Rotary's District 7305 Spelling Bee, which will be held on Saturday, May 11 at Seven Springs. The winner of the District Bee will receive a $1,000 prize. 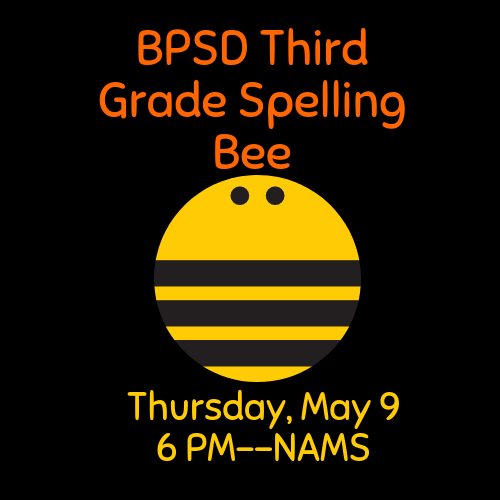 See you at this year's BPSD Third Grade Spelling Bee!